If your storm door does not close properly, your home may be exposed to the outside elements. Check out some of the common solutions below to troubleshoot your issue! Refer to installation instructions to ensure proper installation. Make sure that the handle hardware is properly aligned and latching. Ensure the door closer operates freely and without obstruction. If necessary, adjust closer speed by turning adjustment screw at the end of the closer cylinder. If the storm door features two closers, adjust one at a time with the other disconnected. Check to make sure the storm door is plumb and square in the opening and adjust if necessary. 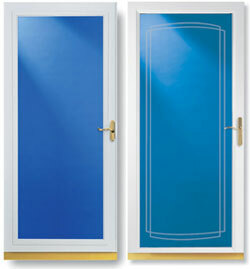 Check for broken, misaligned or excessively worn hinges. Verify that the bottom expander is not dragging on the threshold. Raise the bottom expander so that the rubber sweep barely touches the threshold. This may also help air trapped between the storm door and entry door escape as the storm door closes. If you would like one of our experts to assist you in your troubleshooting, give Joe Wilde a call today!